Bramley apples have an unbeatably tart flavour that works perfectly with the sweetness of the marzipan in this recipe. Heat the apples, 50g/2oz of the caster sugar, the butter and 3 tablespoons of water in a saucepan over a medium heat. Bring the mixture to the boil, stirring well, then cover and reduce the heat until the mixture is simmering. Continue to simmer for 3-5 minutes, or until the apple has softened. Remove the lid and stir well, then cook for a further 2-3 minutes, or until the apple has completely broken down to a purée. Taste the purée and stir in more sugar as needed, then remove the purée from the heat and set aside to cool. 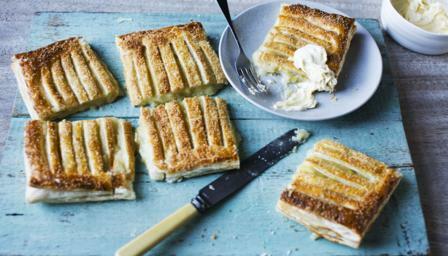 Place one sheet of puff pastry onto a baking tray lightly greased with butter. Lay the slices of marzipan on top of the pastry to cover, leaving a border of 2cm/1in all the way around. Spread the cooled apple purée over the layer of marzipan, then brush the pastry border with a little of the beaten egg. Fold the second sheet of puff pastry in half lengthways, then carefully score the pastry from the folded side towards the cut side at 1cm/½in intervals down the length of the pastry, leaving 2cm/1in intact at the cut side of the pastry. Unfold the scored pastry and lay it exactly on top of the apple-covered pastry, then crimp the edges to seal the two sheets of pastry using your fingers. Trim the edges of the pastry and brush the top of the Bramley apple slice all over with the remaining beaten egg. Sprinkle the top with demerara sugar, then bake in the oven for 25-30 minutes, or until the pastry has risen and is crisp and golden-brown. Allow to cool slightly before serving, serve with the clotted cream.